As technology has become deeply intertwined in all aspects of our lives, it’s become increasingly more difficult to find space in between each moment. Dr Elise Bialylew talks to us about how mindfulness can change your life and the lives of others through her innovative fundraising challenge, Mindful in May. Technology is developing exponentially, and at the click of a button we can access an infinite amount of information. With this privilege, comes the potential cost of information overload, increased distractibility and low-grade background anxiety as we try to keep on top of things. If we wish to remain healthy, happy and clear-minded we need to upgrade our “inner technology” to meet the demands of our increasingly complex world. We are standing on the precipice of a potential paradigm shift with an exciting dialogue unfolding at the intersection of science, technology and the world of wisdom. Leaders in the field of science, technology and meditation are coming together at extraordinary gatherings like Wisdom 2.0 conference or the Mind and Life institute, to explore how we can bring more mindfulness into the digital age. There is a rapid growth of scientific research, revealing what the Buddhist monks have known for generations but couldn’t measure with machines: Meditation is a powerful tool for enhanced well-being and mental focus. Meditation teaches us how to use our inner technology to understand the workings of the mind and in so doing re-sculpt our brains for the better. Meditation is not about becoming passive or giving up on your goals or future plans. In fact, it’s a perfect companion to developing your capacity to think more clearly, be more effective and find wiser solutions to challenging problems. Leading companies in the world, including Google are offering mindfulness training to their employees, recognizing the benefits of meditation in supporting more clarity, innovation and productivity. 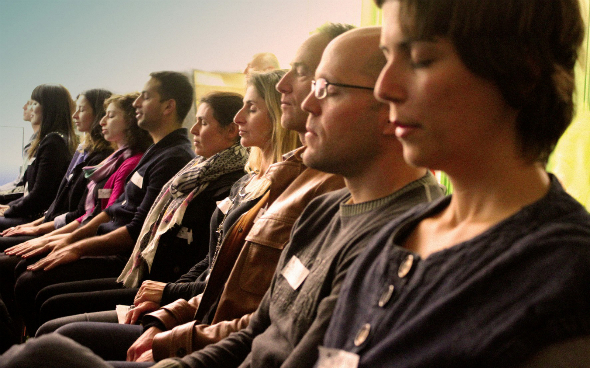 Science is supporting the fact that just two months of regular mindfulness meditation can have significant benefits. When regularly practiced, meditation has been shown to increase our immune function, grow our prefrontal cortex (required for strategic thinking and problem solving), and possibly even protect against DNA damage caused by ageing (through increasing a protective enzyme, Telomerase). To really benefit from meditation, the problem is you actually have to do it. Meditation commonly falls by the wayside for even the most enthusiastic amongst us. Just like physical exercise, bringing a habit of regular meditation into your life can be quite a challenge. So often it seems like there’s not enough time or we just “don’t feel like doing it”. The thing is there is research to suggest that even 10 minutes of meditation, five days a week can improve our attention and focus. Sometimes we need support to follow through on our intentions. Having the support of others or doing something that helps us feel we’re making a meaningful difference in the world, can boost our motivation. This logic has fueled the creation of Mindful in May, a one-month meditation campaign starting on May 1. Delivered online, it will teach you how to meditate and at the same time help bring clean water to those in developing countries. To date the Mindful in May global community has raised enough money to build water projects in Ethiopia and Rwanda helping transform the lives of thousands of people. You’ll get a one month meditation program including 10-minute guided meditations on a weekly basis, access to exclusive video interviews with global experts in the field of meditation, mind wellbeing and a daily dose of inspiration through curated internet links. In the developed world most of us have our survival needs met, but it’s our minds that can cause so much of our suffering. The World Health Organization predicts that depression will be the second-leading cause of global disability burden by 2020. In the developing world, its something as basic as a lack of access to clean, safe water that causes so much suffering. Contaminated water is still one of the leading causes of disease and death in the developing world. Mindful in May addresses both of these issues by offering people a way to learn how to become masters rather than slaves to their minds, whilst helping to improve the lives of thousands of people living without access to safe drinking water. It’s ten minutes a day of meditation to create a clear mind for you and clean water for others. The challenge starts on May 1 so register, donate and invite your friends or colleagues to create a meditation fundraising team to help bring clean water to those in need. Together, let’s see how far we can spread this Mindful Ripple. I’m a total believer in meditation, and when I’m in a regular routine it changes the person I am for the better of course. But sometimes because of the crazy life I lead ‘my meditation time’ gets put to the bottom of list. Any advice/tips for staying consistent?